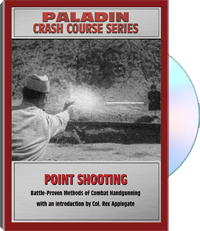 Learn combat shooting the way the members of the legendary OSS did. This black & white video presents U.S. Army Film Bulletin 152, a previously classified training film featuring shooting methods that were developed and refined in actual behind-the-lines combat during WWII. Includes an introduction by OSS legend Col. Rex Applegate.